Walmart, offering you great deals from life till death.. and then some. 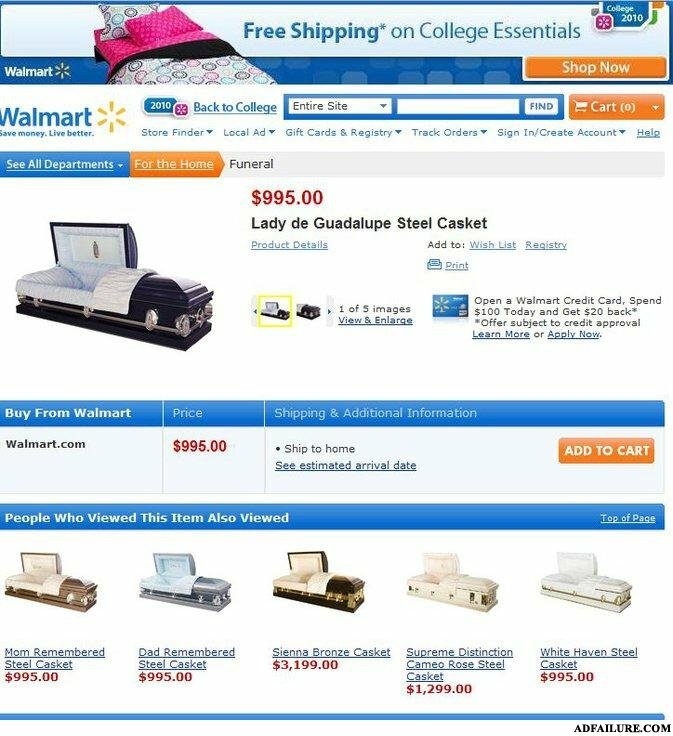 Not sure it's still happening but Walmart collected deceased employee's entitlements, still charging for the coffin though. Show Mom how much you really care. Pre-order her casket from Walmart today! I'm gonna add that to my Wish List! I wonder what Santa would say if that was on my wishlist..
"Free shipping on all college essentials". Does that apply to the coffin too?! Tell your relatives that you want to be buried in cheap Chinese labor, add a Walmart to your wishlist...er Will today! Not quite sure what they do at wallmart college? If you were a Pokemon I'd choose you!